Miami Madness – Get me to the beach! It’s Spring Break week here and I’ve been thinking about an upcoming trip to Miami in early May. I’ve never been to Miami, but I have a Life List item to dance is a small dress and tall heels in South Beach. I’m hoping I get my chance. Until then there is daydreaming about conference-going and event-attending and I’d love to wear this gorgeous Issa jumpsuit that to me just screams Miami. Issa is a favorite designer of Dutchess Kate – but something tells me we won’t catch her in this. The jumpsuit is a love/hate thing with most folks. So, ‘fess up: do you love them or hate them? 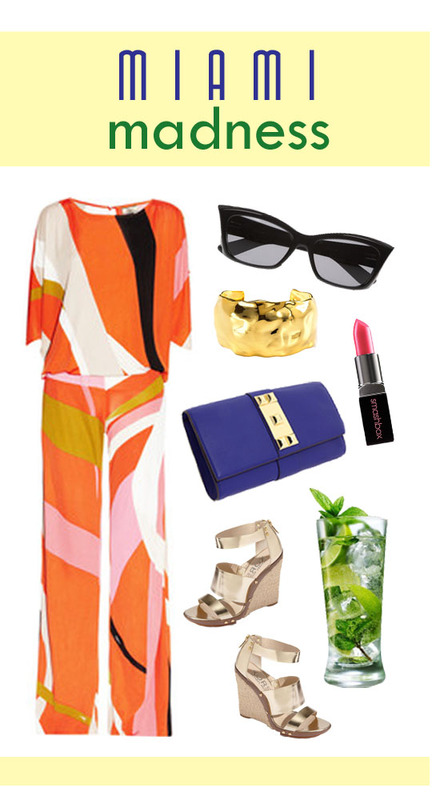 Issa jumpsuit | Vince Camuto clutch | Yves Saint Laurent sunglasses | Alexis Bittar cuff | Michael Kors sandals | Smashbox lipstick | mojito! Intensely dislike. I’d love that print as a dress, or a shirt. It looks very Miami though!